On Board for Beating Cancer. The story of how professional snowboarder Megan Pischke Porcheron beat breast cancer is filled with irony, determination, fight and grace. It is also infused with a desire to give back which she does, continuing with her commitment to B4BC ocean & mountain retreats for breast cancer survivors and through her Chasing Sunshine video which documents her journey and the different treatments she went through, from my chemo to acupuncture, cold cap therapy and more. Excerpt: “Something was just off—on a deep physiological and energetic level. 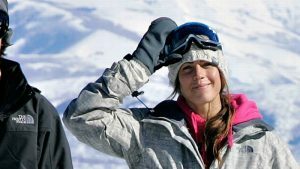 It wasn’t connected to paranoia or fear, and professional snowboarder Megan Pischke had every reason to trust the foundation of her body. She was the powerhouse athlete who could dominate big mountain lines in Alaska comps, stop at the bottom to breastfeed and then head back up for the next lap. For more on Megan, click here.